Many fresh college graduates look for exciting careers in big cities like Chicago or New York. Ross Lawrence was one of them. With a bachelor’s degree in finance, he applied to more than 70 jobs in the Windy City and Big Apple. Then he decided he’d give Nevada, Missouri, a try. 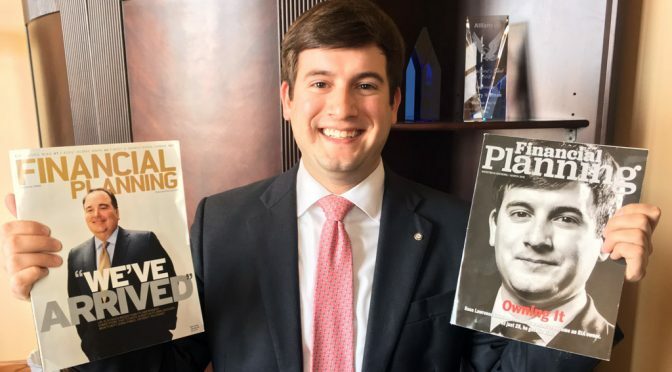 Less than five years after earning his degree, he became CEO and owner of Hoffman Financial Resources LLC, a dually registered affiliate with LPL Financial, the largest organization of independent financial advisers in the United States. He manages four full-time employees and about $120 million in investment assets from clients in 34 states. He has a huge responsibility to his clients. “They literally entrust me with their life savings,” he says. When Lawrence began applying for finance jobs with big banks, he became keenly interested in owning a firm. Walton College’s Career Center posted an ad for an associate wealth adviser with a firm in a Missouri town of about 8,000 people. Lawrence applied for the job with a mission in mind: he wanted to buy it. My family consists of: my fiancé Lorien Mowry and our two cats, Bennett and Menard. I can always be found with: my Fitbit. With a mostly sedentary job, I need a reminder to get up and move! If I had one free day to do anything I want, I would: spend my day relaxing at the beach with close friends and family. My fantasy dinner would include: having a margarita and eating tacos with Warren Buffet and John Bogle. My first job was: a lifeguard at Wilson Park in Fayetteville. When offered a sweet or salty snack, I always choose: salty. I can never turn down potato chips! Favorite guilty pleasure: binge listening to TED talks for hours at a time. He wasn’t shy about it, either. 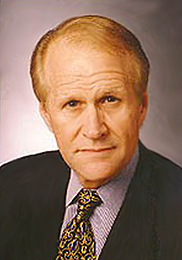 At age 22, during the interview process, he announced his intentions to the firm’s founder and owner, Greg Hoffman, who was entertaining the idea of retiring within the next ten to fifteen years. He took Lawrence seriously. The two worked out a purchase plan and, as of January 2016, Lawrence assumed ownership. Now he tells students and new graduates to not be shy. Many firms are owned by baby boomers – those born between 1946 and 1964 – who are retiring and need someone skilled to take over and make sure their clients are taken care of. They’re often in cities and towns where there’s little competition for financial planning, which makes for good opportunities, Lawrence says. A Fayetteville native, Lawrence initially majored in biology with the idea he would be an oral surgeon. He soon switched gears, however, when he received a tip for a promising stock. Though he ended up not making the investment, it got the wheels spinning. He Googled “finance,” grabbed his best suit and began asking for internships at area firms. He found one at Merrill Lynch Wealth Management in Rogers, where he worked for two years while finishing his degree. The decision to change majors also delayed his graduation. To catch up, he went to summer school while working two business-related internships and at the Olive Garden restaurant. During this time, the Great Recession took hold. Lawrence saw bad financial advising at this time, as well as good. The bad, in fact, was so awful he vowed to be an adviser who always puts his clients’ needs first. 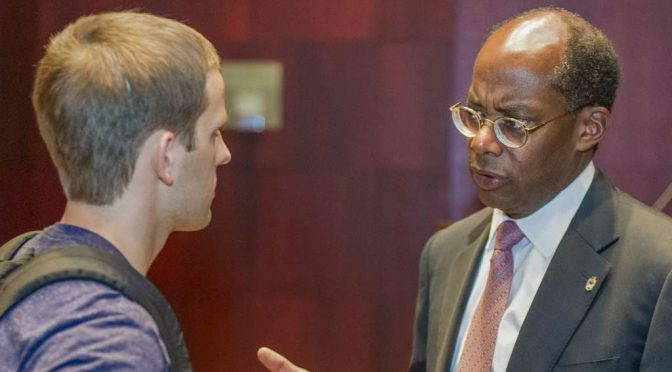 With motivation in place, Lawrence took advantage of his Walton education. Mark Zweig’s entrepreneurship class proved to be very important and was where he learned the differences between the types of business ownership and the tax advantages of each. He says he still uses the Excel spreadsheets from his financial modeling class. And, of course, without the Career Center, he might have never known about Hoffman Financial Resources. Since taking over, Lawrence is expanding his firm to Fayetteville and spends at least a couple of days a week there. His goal is simple: to keep growing the firm by providing the best client experience possible. “When it comes to financial planning and investing most people just hope that they are doing things the right way, we make sure that it’s not just ‘hope’ that’s guiding them” he says. Talesha Christian isn’t shy to say it. She loves math. From the time she was in grade school, she has enjoyed working with numbers. Now, as an Accounting and Financial Investments major at the Sam M. Walton College of Business, she sees so many opportunities where she can channel her passion. The sophomore from El Dorado says she decided on her major after taking Business Foundations, a course that offers a hands-on, interactive experience in the business process. Talesha says the class enabled her to learn aspects of debits and credits and, through simulations, management and human resources. “But I really liked the accounting side of it,” she says. 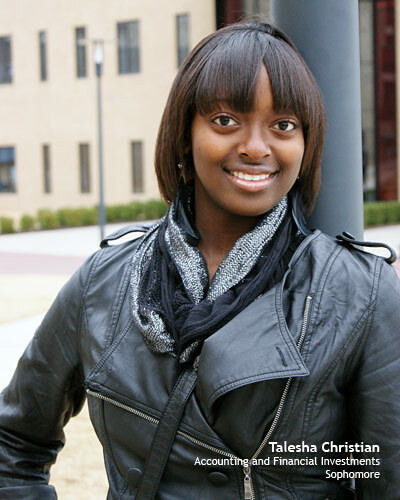 With many of her required classes out the way, Talesha, who was accepted into the University of Arkansas Honors College last year, will dive into her first accounting class this summer. She already has a good idea of what she wants to do after graduation: to be either an auditor, a private accountant or a financial analyst. When she’s not sitting in a classroom, Talesha is a resident assistant at Maple Hill South. She says she enjoys being a role model to the incoming freshman still unsure about their new environment. Her job also involves planning programs and decorating for special events. Perhaps, she adds, she may someday work for someone who appreciates her experience as a residential assistant. Talesha is a mentor with Razorback Bridge, a program that began a year ago through the Office of Diversity and is coordinated by the University of Arkansas Multicultural Center. Through the center, she is also is a mentor with the Connections Mentoring Program, which pairs upperclassmen with first-year, underrepresented students. She says she can empathize with the freshmen. “I remember how scared I was when I was first on campus,” she says. If that weren’t enough, Talesha is also a member of Student Support Services, a program that helps navigate students through the university system with the goal of helping students in any way that they can, so that they may become successful upon graduation. “They take you in and check with you to see if you’re going to class, and to make sure you’re doing well. They make sure you are taking the necessary steps on the road to becoming successful,” she says. Yet, her involvement on campus doesn’t stop there. She is a member of the university’s Black Student Association as well as the Associated Student Government Judiciary, which is in charge of ensuring the adherence to the ASG Constitution and Code, and they administer the ASG executive elections. Jessica Lind has another semester to go before graduation, yet she is already interviewing for a finance job. She says she is confident she will have something lined up by next summer. She has the George W. Edwards Jr. Career Center to thank. Located in the Sam M. Walton College of Business, the center provides a variety of services from advising students to preparing them for job interviews. Jessica says she has made good use of it. “I definitely think the Walton College career center is one of the most beneficial programs at the university,” Jessica says. Jessica, who grew up about an hour south of Fayetteville in Alma and nearby Fort Smith, says she initially took science classes with thoughts of becoming an optometrist. She says she recognized, however, that she might be able to put her math and analytical skills to better use. It was the business world calling. She changed her major to finance with a minor in accounting, and she says it’s paying off. When she meets with job recruiters, they’re always pleased when they learn about her accounting background, she says. They also look at her involvement in a portfolio management class, Jessica says. She is among the 18 students selected to take the class where the students manage The Rebsamen Trust. The student-management investment fund was established in 1971 by the late Raymond Rebsamen of Little Rock. The class enables her to get hands-on experience with managing a portfolio of equity and fixed-income securities with the added bonus of a special trip to the New York Stock Exchange. 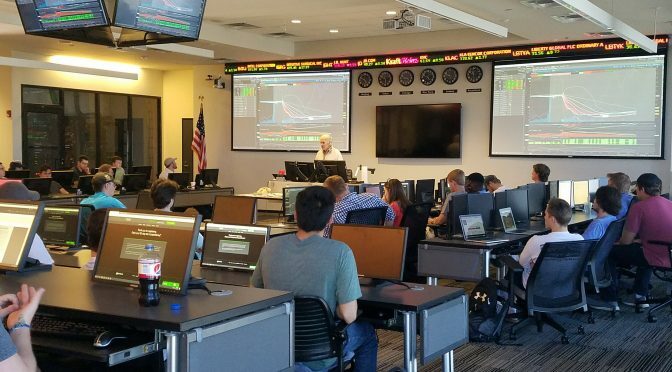 The students work on the fund from the Walton College’s Global Markets Financial Center located in Willard J. Walker Hall. “We pretty much live in the trading center,” Jessica says. Jessica first tried out her business school knowledge when she interned in the summer of 2011 at Arkansas Best Corp., a Fort Smith transportation company. Using a complex mainframe computer system, she researched and compared costs for pricing household moves. Jessica is a member of the Walton College’s Finance Club and a member of the Senate in the University of Arkansas’ Associated Student Government. She also is vice president of standards for the Community Blood Center of the Ozarks, an elected position where she keeps track of volunteers’ attendance and hours. “I had volunteered there a couple of times, and I really liked the people,” she says. She also plays many roles in the university’s Greek system. She is Pi Beta Phi sorority’s social chair officer, which involves coordinating events with fraternities and other sororities, and is a delegate for Greeks Advocating the Mature Management of Alcohol. She also serves as an administration committee delegate for the University of Arkansas chapter of the National Pan-Hellenic Council, comprised of eight sororities on campus that administers Pan-Hellenic rules and regulations. Jessica also volunteers with children’s literacy programs and picks up trash on Fayetteville’s walking trails and parks on behalf of Pi Beta Phi’s philanthropy program. Jessica also knows what she’ll do once she settles into a job: work toward becoming a chartered financial analyst.